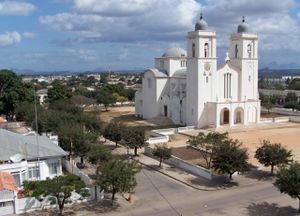 Nampula is the capital of Nampula Province in Northern Mozambique, surrounded by plains and rocky outcrops. 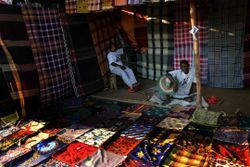 The city is connected by plane (LAM) to Maputo; it hosts the regional market and is well supplied with shops, banks, hotels and restaurants. Flights link Nampula (IATA: APL) with several destinations in Mozambique and abroad. It's a small airport located 4 kilometers away from town, which could be managed on foot. The way from the airport passes the bus and the train stations. International connections exist to Nairobi (Kenya), Johannesburg(South Africa) and Dar-es-Salam (Tanzania). Domestic connections exist to Maputo, Beira, Pemba, Tete & Lichinga, all through LAM (Mozambique's National Airline). It is difficult to find LAM flight seats on popular e-ticketing websites, best is to book on LAM website http://www.lam.co.mz/ . A daily (except Monday) train departs Cuamba (not far from the Malawi border) for Nampula. The train departs at 05:00 and takes 10-12 hours to reach Nampula. Minibuses (chapas) from Ilha de Mocambique (Mozambique Island) depart between 03:00 and 05:00 (3-4 hours). Later, you can take a chapa/truck to Monapo, from where regular chapas connect to Nampula. The bus station is located some 5 minutes from the train station, on the way to the airport. The Copacabana in front of the Tropical Hotel is recommended. Good seafood. Cold beer and wines. Picturesque settings. You'll find your NGO guys/ladies from all over the world there! The Restaurant of Tropical Hotel is also good, but less choices than the Copacabana. Avoid the Girassol hotel restaurant at all costs! The food there is warmed up and it's a festival of soggy fries in glassy sauces. Despite the previous comment, the Girassol hotel restaurant still is one of the best restaurants in town, with a good breakfast, sunday lunch and dessert buffet. Definetely should not avoid it! The Sporting is a good place to eat if it's not raining: nice tables set outside and separated by neat little hedges. Great place to watch sport events on a telly. Pensao Parque, Ave Paulo Samuel Kankhombe (close to the Residencia Monte Carlo), similar rooms. English (and some Portuguese) language radio transmissions are available from BBC World Service on 88.3MHz. 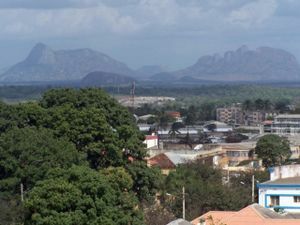 Nampula is the staging post for journeys further north (towards the Tanzania border) or west (towards Malawi). The only passenger railway service in the country connects the town with Cuamba near the Malawi border. The train to Cuamba departs Nampula daily (except Mondays) at 05:00. The journey takes 10-12 hours. Tickets must be be bought the day before from a small window at the train station, between 14:00 and 17:00. The service is quick, friendly and fares are posted on the window. Apparently, you can also buy tickets on the day of departure from the same window (but this is not confirmed). There is a 3rd class (all days) and a 2nd class (on alternate days - from Nampula on Tuesday, Thursday, Saturday). There is no 1st class anymore. The 3rd class cars are simple wooden (hard) benches of 2-3 people providing for a 'real' African experience. It is not bad though, at least if you have a seat. A ticket of neither class guarantees you any seat. The boarding of the train starts at 04:00, but in order to have even a slightest chance of getting a seat, be at the gates well before 03:00. Even then you will notice two long queues - one male and one female. The guards open the gates at 04:00 and only allow passengers with tickets. Rush to the closest car to claim a seat. Males and females usually board separate cars, but it's more a convention than a law. Later in the journey they become mixed. If you're a solo female or a female party, queue with other women and travel in a female car. The opposite should apply to males and male parties. If your party is mixed, have females queue with females (the female queue could be shorter and move faster), then have them claim seats for all of you in a male car. Traveling males do not carry as much produce as females, and certainly no screaming babies. One thing to avoid is the first car, since the fumes from the engine are literally breathtaking. There is no dining car, but the train company employees roam around and sell soft drinks and biscuits. Prices are low. The train also stops every several minutes, where people at stations sell all variety of food: fruit, snacks, chicken, drinks, etc. It's still wise to carry some snacks and water, though. The whole train has no lighting (so carry a flashlight for winter departures), toilets are vomit-inciting holes in the deck, and external doors tend to be missing as well. Other than that it's a safe way of traveling. Once in Cuamba, minibuses depart from the train station to Mandimba (on the Malawi border), Lichinga and others. Nampula is also the nearest airport to the port-town of Nacala. Nacala has a natural harbour with a draft of nearly 10 meters. There are many isolated beautiful beaches with clear waters in and around Nacala. Most of these beaches have no names and are meant to be explored. Flying is the best mode of travel to places which have airports. Be careful as all flights are always full, and it is possible to purchase a boarding pass without buying a ticket first. Travellers who have booked a ticket are advised to reach the airport 2 hours before flying-out time and claim their boarding passes. Aircraft luggage is frequently frisked and objects of interest(electronics, shaving kits) may be picked out by greedy luggage handlers. It is best to pay 200 Mzn and get your luggage covered in plastic sheets. This page was last edited on 20 May 2016, at 18:12.